It is 2 weeks before Passover and I am trying to get out to you as many recipes as I can . This one is a very nice light fruit cobbler for dessert it is very easy to make and small prep time. 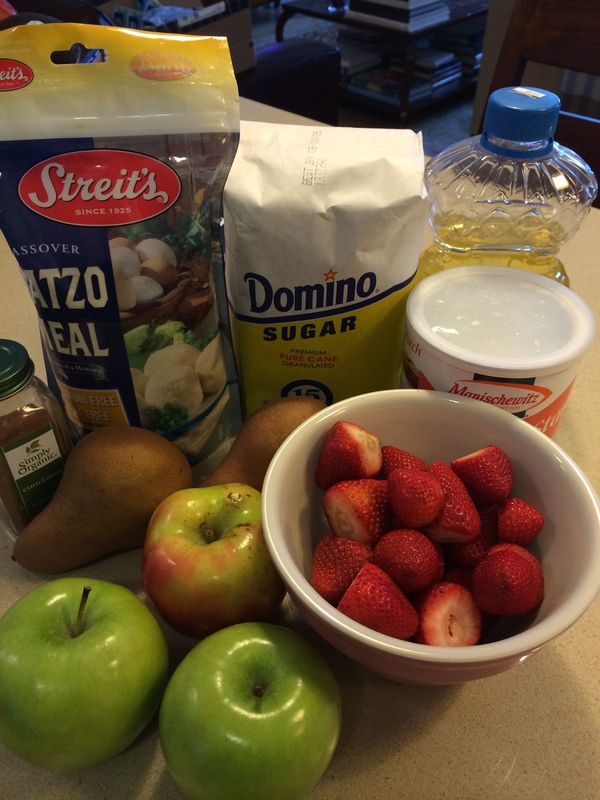 It’s nice to make this with a few different fruits , I used apples, pears and strawberries. Use whatever fruits you like, but I will say that the strawberries added the zing it needed, I wouldn’t omit them. I used a whole pint of strawberries and sliced them thinly. 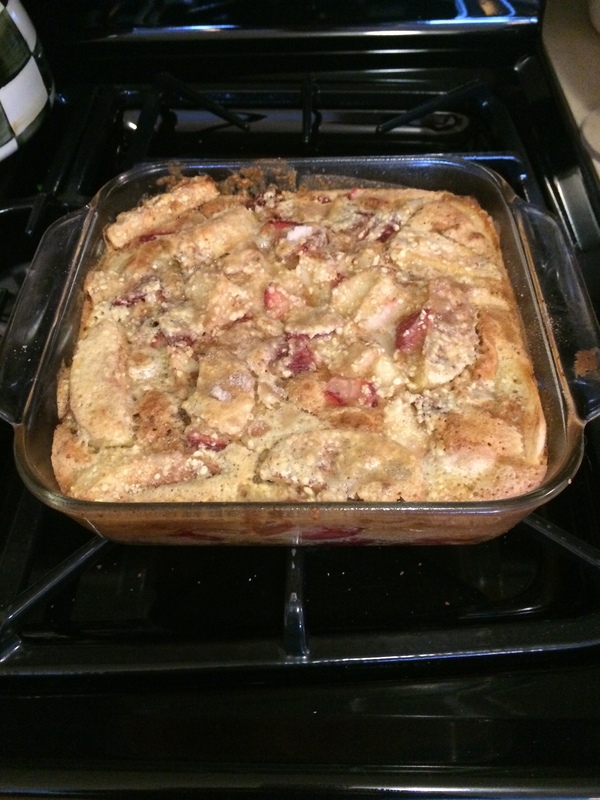 Pretty tasty for a Pesach cobbler. Preheat oven to 350 degrees. Lightly spray a 9×9 square baking pan. Beat eggs with sugar until well blended. Add the oil, matzo meal and potato starch and blend well. I used an electric mixer. 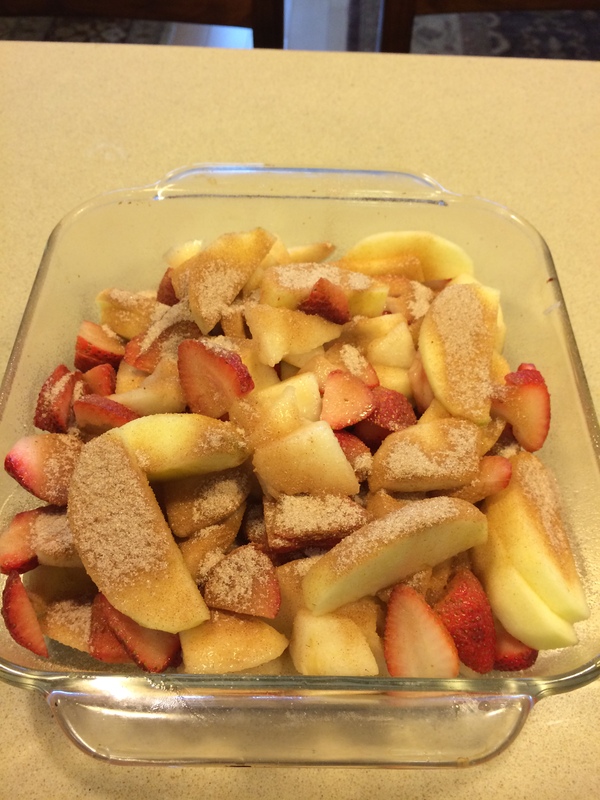 Put all the fruit in the pan and sprinkle with most of the cinnamon sugar, reserving a little for the top. Spoon the batter over the fruit, covering as much of the fruit as you can. Sprinkle with remaining cinnamon sugar. Bake until the topping is set and just turning a tan like color, about 45 minutes. Serve hot, warm or at room temperature. 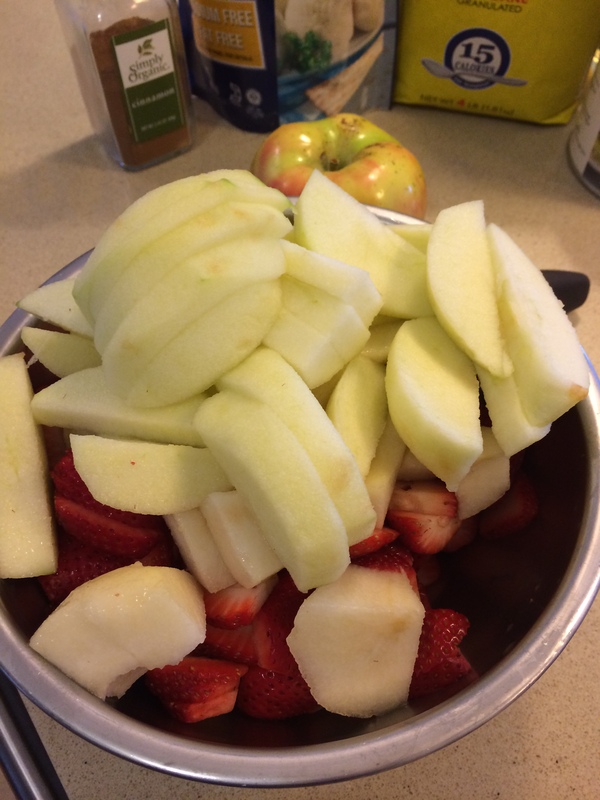 *If you let the fruit sit for a while with cinnamon sugar mixture the flavors really soak in. So if you have the time I would do this. If not , it’s fine as well. This will freeze perfectly . Just let it completely cool down before freezing. I cut into squares for freezing. This entry was posted in Baked Goods, fruit cobblers and tagged Cobbler for Passover, fruit cobbler, Passover Cobbler, Passover fruit cobbler. Bookmark the permalink. Made this last year for the first time. Will make again. Easy, and delicious. I used apples, strawberries, blueberries and a few purple plums.